Moying Li-Marcus, born and raised in Beijing, China, moved to the United States in 1980 to pursue graduate studies. She holds an MA from Swarthmore College, an MBA and a Ph.D. from Boston University, and currently serves as vice president and senior analyst with a Boston-based investment management firm. She lives on Beacon Hill. Since Boston's legendary Beacon Hill was first settled nearly 400 years ago, the neighborhood's spirited residents, generation after generation, have created and maintained a unique environment that is both timeless and forward looking. They have responded to social, economic, and political changes over the centuries by integrating the best legacies of the Hill's past into plans for the community's future growth and vitality. In this well-crafted and lavishly illustrated work, Moying Li-Marcus takes the reader on a fascinating tour of the historic yet vibrant district of cobblestone streets, red brick sidewalks, gas lamps, and elegant Bulfinch architecture. Weaving together the personal reminiscences of dwellers with compelling narrative, she captures the essence of this special community in the heart of Boston. Here one meets both renowned and long-forgotten Beacon Hillers—Puritans, Brahmins, bohemians, and immigrants—who have shaped and defined this culturally rich and diverse neighborhood. Here, too, one relives memorable moments in the Hill's long and colorful saga, including the traditional candle-lighting and caroling on Christmas Eve, the annual Window Box Contest, battles to save the cherished brick sidewalks, the Charles Street Fair, the Mothers March against Storrow Drive, and the persistent problems with traffic, parking, zoning, and housing. The vital and sometimes controversial role of the Beacon Hill Civic Association, one of the nation's oldest and most tenacious neighborhood groups, in forming the area's living history is also thoroughly discussed. 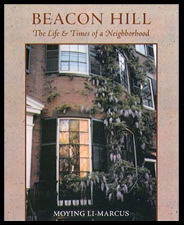 Published on the eightieth anniversary of the Civic Association's founding, Beacon Hill will delight Boston residents, tourists, and historians.